Rivera’s story is unfortunately far from unique. 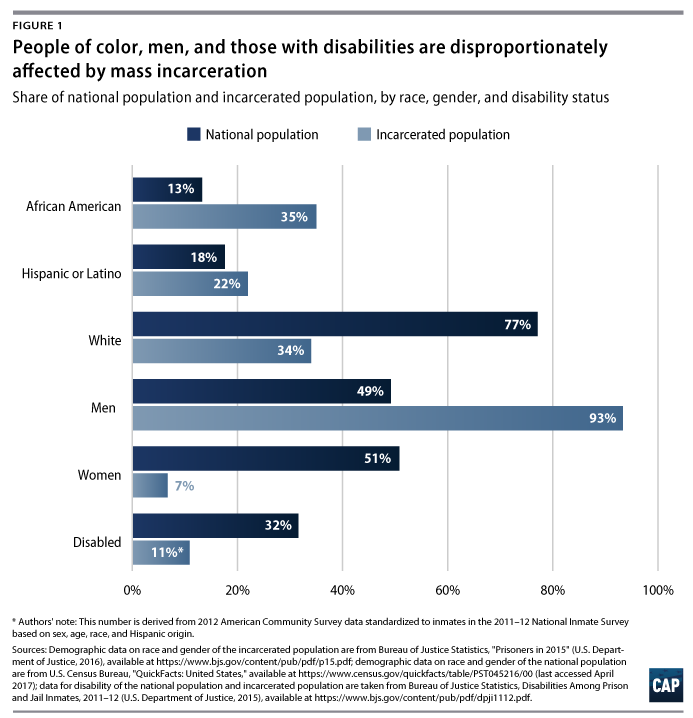 Today, as many as 1 in 3 Americans have a criminal record.2 This has meant that each year, millions of people with criminal records struggle to find good jobs that make it possible for them to support their families and move on with their lives.3 For people of color and those with disabilities, who face overwhelmingly disproportionate rates of incarceration, a criminal record is yet one more obstacle to employment in a labor market that already discriminates against these groups. The challenges Rivera and millions of others in similar circumstances face do not need to be inevitable. Governments at all levels can take steps to improve the labor market attachment of the formerly incarcerated—beginning while they are still behind bars. Apprenticeship programs for the incarcerated, which combine on-the-job training with relevant classroom instruction, could significantly improve employment outcomes for returning citizens. This is especially true if participating inmates are earning wages for their time on the job. This brief argues that greater access to paid prison apprenticeship programs could effectively improve inmates’ post-release outcomes, particularly for a group of individuals who already face significant barriers to labor market entry. The formerly incarcerated face numerous obstacles to re-entering the labor market upon release. 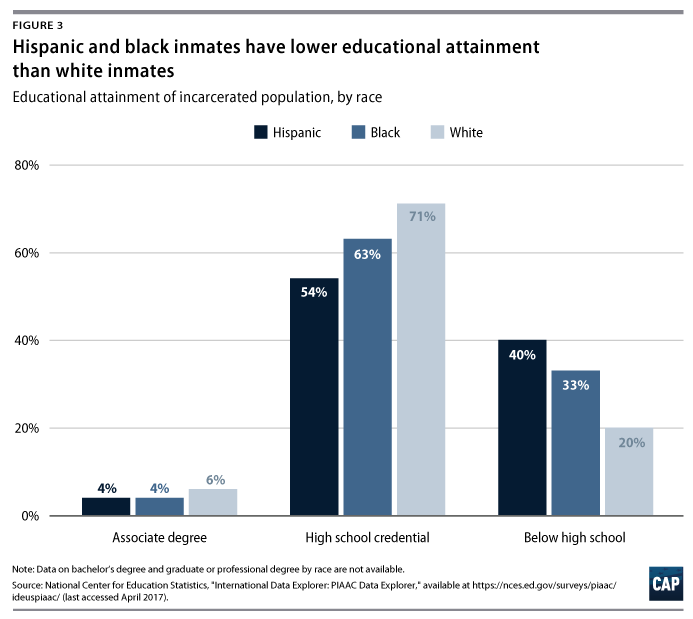 Lower levels of educational attainment; the stigma of incarceration; a lack of employment history or long periods of unemployment; and a criminal record all increase the prospect of unemployment. The most common type of prison work is facility support.30 Inmates who work in facility support perform various maintenance chores, such as cooking, cleaning, laundry, cleric work, and more. The second most common type of prison work is public works assignments.31 Through public works assignments, inmates work for state or local governments on projects in the public interest, such as picking up trash, tending to parks, or construction on public buildings. Where prison work programs fail to offer opportunities for participants to learn skills that will be valuable in the labor market, apprenticeships, which offer paid on-the-job training, may be the solution.39 These programs could improve individuals’ job prospects post-incarceration, thus lowering the chance of recidivism. Apprenticeships offer the incarcerated population the opportunity to gain valuable skills and a credential that is marketable in the broader labor market. 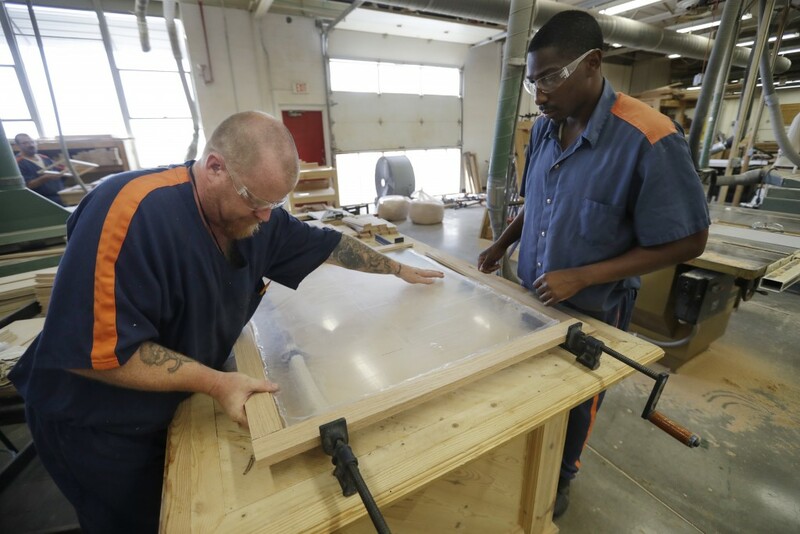 Additionally, apprenticeship programs allow incarcerated individuals to connect with potential employers. Ideally, these programs should help inmate apprentices connect with outside employment opportunities—by partnering with local unions and employers to help connect inmates with jobs prior to release. In addition to the DOL certificate, some apprentice programs offer opportunities for participants to earn industry certifications while incarcerated.50 In some cases, the programs will award transcripts to apprentices who have completed a certain percentage of their program before release, which can be used with outside employers to demonstrate competency. The Iowa Department of Corrections, or DOC, has experienced success with its recently implemented apprenticeship program. In 2014, the state’s DOC transitioned existing prison industry jobs into apprenticeship programs. Today, it sponsors 19 registered apprenticeships across their nine facilities. The majority of the state’s apprentice programs are run through Iowa Prison Industries in occupations such as cabinet making, metal fabrication and welding, screen printing, and computer operations. Since 2015, program participation has increased by more than 700 percent, and the program currently has 277 registered apprentices. Since starting the program, 71 apprentices have completed it. The DOC is working on collecting employment data on all completed apprentices, which will likely be available in the fall. The DOC also works with employers, unions, workforce development boards, and other organizations to help participants secure gainful employment after release. Despite data indicating that inmates want to participate in job training programs, few prisons currently offer them. 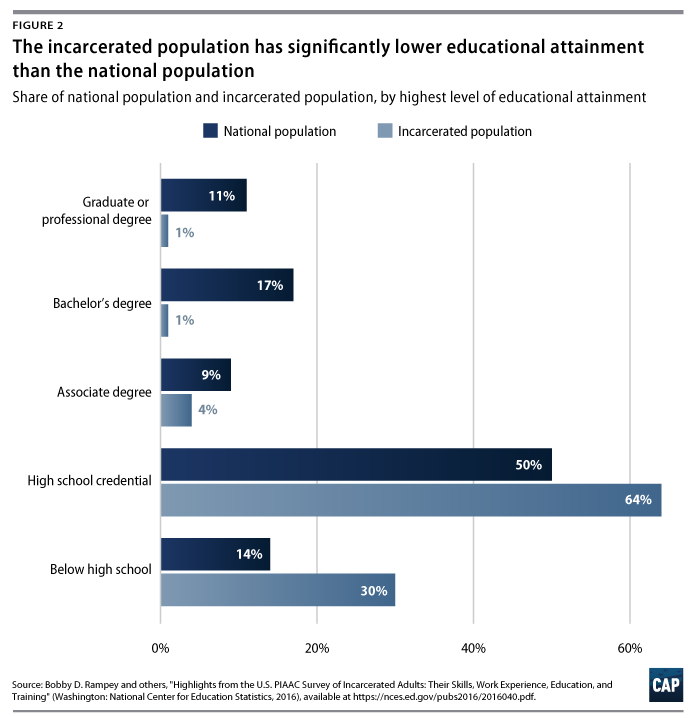 A study by the National Center for Education Statistics, or NCES, found that only 7 percent of inmates received certificates from a college or trade school while incarcerated, while 29 percent of respondents wanted to obtain these certifications. Again, according to the NCES survey, 39 percent of inmates who indicated they wanted to enroll in an educational program gave as their main reason to do so a desire to “increase the possibilities of getting a job when released.” That same survey found that 23 percent of inmates reported having participated in a jobs skills or job training program during their current incarceration, while 14 percent were on a waiting list for entering a job training program.53 Expanding apprenticeships will help fill this need and more—providing inmates with the job training and work experience to gain employment post-incarceration. Apprenticeship programs may be even more beneficial for individuals who face multiple barriers to labor market entry, such as racial or other forms of discrimination. 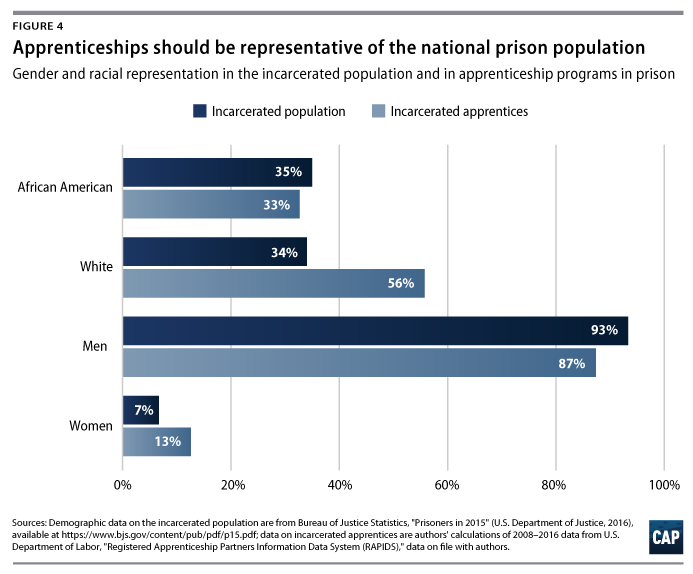 Greater access to prison apprenticeship programs could help these individuals improve their skills and obtain a credential that holds value in the labor market, which in turn could help mitigate other barriers to labor market re-entry. Apprenticeship programs—although often male-dominated because they are concentrated in the male-dominated building and construction trades—hold great potential for female inmates as well.54 While women make up just 7 percent of the incarcerated population in the United States, they represent 13 percent of incarcerated apprentices. (see Figure 4) If these programs are made more available to women who are incarcerated, it can help these women enter well-paid and traditionally male-dominated fields, such as construction, upon release. Prison apprenticeships would be much more beneficial to apprentices if they paid better wages. The formerly incarcerated often find hefty financial burdens waiting for them upon release. Furthermore, many face significant court fees and fines accumulated during incarceration that can push them into debt.61 Returning citizens also face the challenge of returning to families that have suffered financially as a result of that individual’s incarceration, due to the loss of family income or to the lack of child support. 62 Indeed, 2 in 3 families of incarcerated individuals reported difficulty meeting basic needs because of a family member’s incarceration, and almost 20 percent of families with incarcerated members were unable to afford housing due to the loss of income resulting from their family members’ incarceration.63 Paying inmates could help keep their families afloat financially while they are incarcerated. Returning citizens face many barriers to re-entering the labor market upon their release. Apprenticeships can help smooth this difficult transition by equipping returning citizens with real-world, in-demand skills that can improve employment and earnings prospects going forward and reduce the likelihood of recidivism. To be clear, apprenticeships are not a panacea—they cannot wholly alleviate the discrimination that the formerly incarcerated, especially individuals of color and people with disabilities, face in the labor market. Other policy changes, such as fair chance hiring, record-clearing, inmate access to Pell Grants, and other criminal justice reforms are badly needed as well. But apprenticeships do offer one policy solution for putting a more secure future within reach for returning citizens and their families. While the number of apprenticeship programs in prisons is growing, they are still too rare in America’s massive correctional system. 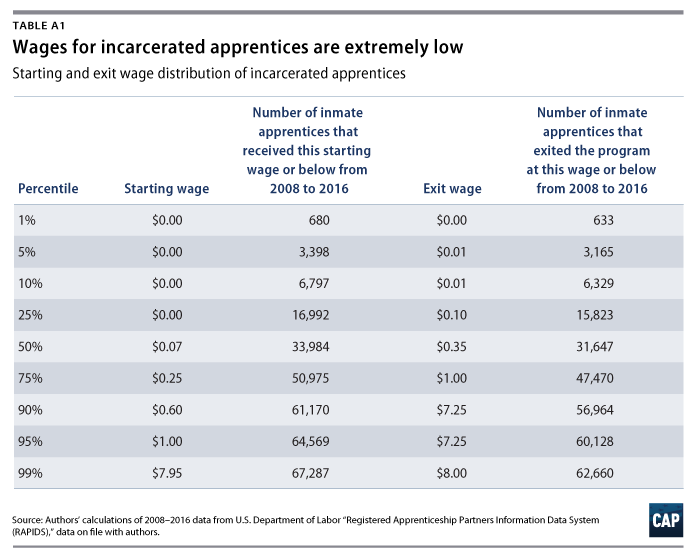 Policymakers should expand access to apprenticeship programs for incarcerated individuals by investing in strategies to develop high-quality apprenticeship and pre-apprenticeship programs. At a minimum, high-quality programs should have relationships with outside employers and unions to help establish connections to jobs upon release. Policymakers should also consider amending the FLSA to explicitly include incarcerated workers, to ensure that they are paid at least the minimum wage for apprenticeships and other forms of prison work. Additionally, although certain apprenticeship programs have collected data on post-release employment and recidivism of those who have gone through the programs, the DOL should standardize this data collection across all apprenticeship programs. As America begins to come to terms with the damage the carceral state is exacting on its citizens—disproportionately people of color and individuals with disabilities—paid apprenticeships for inmates offer an evidence-backed plan to give newly released individuals the skills and experience they need to secure gainful employment once they return to their communities. These apprenticeships benefit not only inmates but also their communities, since returning citizens will have the skills to be productive members of their community. Policymakers should take note. The DOL’s Office of Apprenticeship administers the RA system. As noted in a CAP report, “Training for Success,” the system consists of a national office, six regional offices,64 and local offices in each state.65 The Office of Apprenticeship directly administers the program in 25 states and delegates some operational authority to state apprenticeship agencies in 25 states and the District of Columbia. Annie McGrew is a Special Assistant for the Economic Policy team at the Center for American Progress. Angela Hanks is the Associate Director for Workforce Development Policy on the Economic Policy team at the Center.